Print the ornament on regular paper or cardstock. Cut out all the pieces. Puncture two holes at the top of the body, indicated by two dark circles. Thread a string through the holes and tie it in a loop. This is how you will hang the Agent P Ornament. To put the body together, cut each “A” tab along the side opposite the dotted line. Make all folds along the dotted lines. Using glue or double-sided tape, secure each “A” tab to its corresponding piece. Secure the “B” tab to its corresponding piece, and close the body with the “C” tabs. Next, make all folds along the dotted lines on each leg. Using glue or tape, secure each “D” tab to its corresponding piece. Attach the legs to Agent P’s body using the remaining tabs. The black lines at the edge of each leg should line up with the black lines at the bottom of Agent P’s body. Fold the tabs of the upper beak away from you. Gently bend the beak to create a ball cap effect. Be careful not to create a crease down the middle of the beak, only a slight curve. Secure the tabs to the front of Agent P so that the middle of the beak lines up with the bottom of the orange triangle on Agent P’s face. Be sure to glue the tabs under the beak so the white does not show. Curve the lower beak using the same method as the upper beak. Turn the lower beak over so that the colored side is facing down. Fold the larger tab up and glue that tab to the front of Agent P’s face, just under the upper beak. Glue the smaller tab to the bottom of the upper beak so Agent P’s mouth is closed. Lay Agent P’s eyes over the light blue area above the beak, and secure with glue or double-sided tape. Fold each tab on the hands toward you and glue them to the sides of Agent P where indicated with a small light blue square. Secure each hand to the bottom of each arm so that the colored side is facing up. Thumbs should face forward. Fold and secure the two sides of the tail together so the design is two-sided. Do not glue the tabs together. Instead, butterfly the tabs and glue them to the back of Agent P.
Fold and secure the two sides of the hat together so the design is two-sided. Do not glue the tabs together. Instead, butterfly the tabs and glue them to the top of Agent P’s head, just in front of the holes. 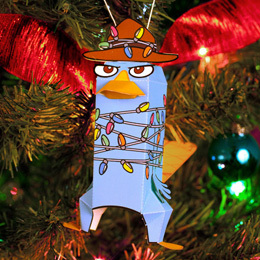 Now your Agent P ornament is ready!